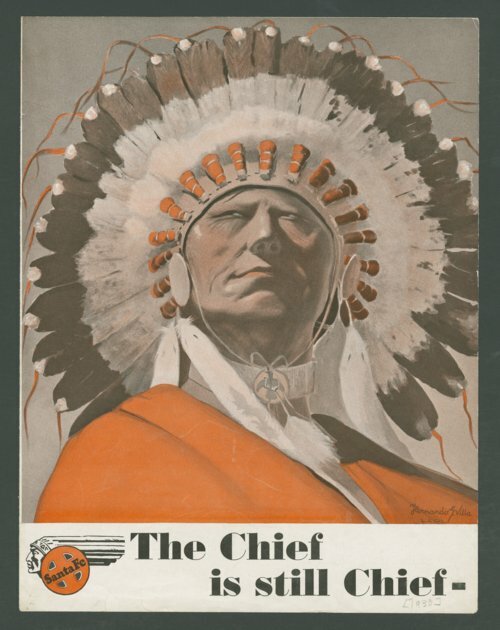 This flyer published by the Atchison, Topeka & Santa Fe Railway Company encourages travelers to take advantage of the new luxuries added to the passenger train the "Chief." Some of the new luxuries include: a spacious lounge car, porcelain wash bowls and thick soft rugs in the car vestibules. On the backside of the flyer technical drawings illustrate the types of cars carried on the "Chief." This Native American can also be seen in Kansas Memory item number 309137.